It has taken me this long, but I finally understand what makes Steven Spielberg one of the most revolutionary film directors of all time and quite possibly the most influential living director – Spielberg not only creates the stories that he would want to see in theaters, but he makes the ones that he feels need to seen. The ones that reflect history that is often overlooked, and tells it in a medium that is more accessible than most others. Whether it is the story of the Munich incident, the tale of rescuing one man in the middle of WWII or the liberation of 1,100 Jews during the Holocaust, Spielberg dared to bring images that were either thought impossible or unthinkable. And he makes it work better than any other director. All this took was watching “Schindler’s List” and realizing this was made by the same guy who brought us “Jurassic Park,” “Raiders Of The Lost Ark” and “E.T. The Extra-Terrestrial” to see that Steven Spielberg is the most imaginative filmmaker who is also in touch with the importance of history. For the record, “Schindler’s List” is the second very important Spielberg film that I’ve watched for the first time, long after people have praised the hell out of it. This makes it difficult to discuss, since everything that needs to be said about the film has already been said – it is a film that does not pull any punches on one of the darkest times in human history, and shows that war brings out the best and worst in humanity, including our lust for power, but also our stunning will to save those who cannot save themselves. The scene which stands out to me is during a party, when Oskar Schindler (Liam Nesson) and Amon Goeth (Ralph Fiennes) are drunk and talking on a balcony about how powerful Oskar is for holding his liquor so well. This leads into a discussion about what it means to be powerful. Goeth believes that it is to hold the lives of so many helpless people, and to be able to extinguish them at any point. Schindler retorts, saying that power is the ability to take away a life, and then to pull back. To be able to have this strength, but the humanity to forgive and understand one’s faults. From the beginning, I believe Oskar Schindler intended to save as many lives from the Nazis as possible, even though he probably wouldn’t admit it. He witnessed the world falling apart around him, innocent lives being viciously taken away by monsters with no remorse. Oskar Schindler used the skills and possessions that he had to make sure as many of those innocents could live just one more day. Yet it is tragic that this great man felt like he could have done more. 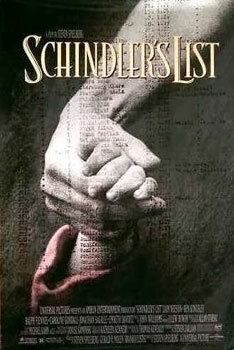 “Schindler’s List” is a poetic look at the Holocaust, with a scope and atmosphere that is baffling to the think about. So many extras needed for the victims of this tragedy, including some who had to lose weight and pose as corpses. All while still feeling grounded in humanity, giving us a story of a man who did not want to watch the world around him fade away in flames and bloodshed.